Ahhhhh. 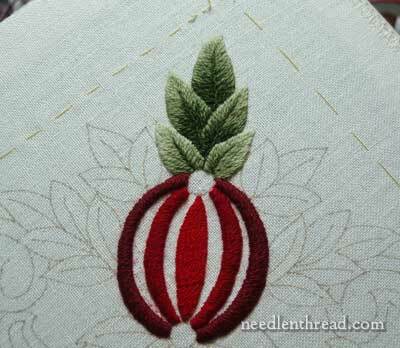 It’s Saturday, and much of today, if I have anything to say about it, will be spent with this wool embroidery project (the Pomegranate Corners) that I’ve been muddling through. It’s true that I’ve been putzing around on it! 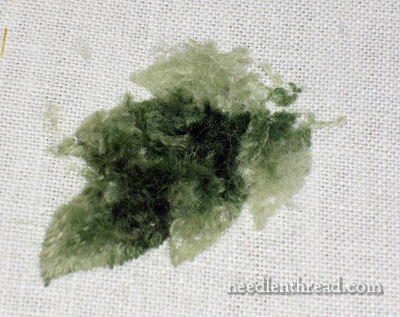 I’ll share with you my source of consternation on the project, which I think most needleworkers can relate to at some point or another. So the question is, why the hold-up on this particular work, and how can we get over the walls we build when frustration sets in? This is where I left off, last time I posted about the pomegranate project. It hasn’t gone anywhere at all since then. When I began this project, I had only a vague idea of where I was going. (Remember the six P’s: Proper Prior Planning Prevents Poor Performance!) Still, I knew I wanted to work with wool again, and I liked the overall design of the piece. So, combining those two things – a pattern and some wool thread – I launched in. However, a pattern and thread is not enough. If the writer sits down with paper and pencil and no plan and no “vision,” do you really think a literary masterpiece is going to emerge? Probably not. The better you plan, the less frustration along the way, and the more likely you’ll come to a satisfactory end. Now, in working with kits, the planning is already done for us. The embroiderer who wants a fairly frustration-free experience can opt for kits, pre-planned, with all the materials right at the fingertips, ready to go. This is GREAT. I love working kits! Kits from great designers like Tanja Berlin, Trish Burr, Jane Nicholas, Alison Cole – oh, yes, please! They satisfy my desire to embroider beautiful things. But with the wool pomegranate project, I wanted to explore a bit. To play around with wool, and to do it on a design that I think is kind of neat. But that’s all I really thought about when I stepped forward with the project. Do you ever find yourself working on an embroidery project and running into a frustrating or complicated area, and then putting the project aside until it withers away, forgotten, in a stack of similar unfinished attempts? Well, the way I see it is this: in situations like that, the only way you ever find peace is to make a decision either way. Either I’m going to do it, or I’m not going to do it. When dealing with an embroidery project, it’s not as if we’re talking about a moral decision here – whichever way you decide doesn’t really matter in the whole Scheme of Life, if you’re willing to swallow the expense of the project or the time you’ve put into it. You can chalk both of these up to Experience, because at least you do get some experience out of incomplete projects. To surmount difficulties like this, re-think where you are going, what you want to get out of the journey, and what it will take to get there. Ask for input from a friend, if you need to. Clarify your objectives. And then make a decision: either go forward, or don’t. If you decide to go forward, bite the bullet and get to work! Once the frustrating part is out of the way, the rest will be much easier – and much more fun! With the Pomegranates, having run into the Wall of Frustration, it’s time to scale the wall – to re-think what I was doing and where I was going with it. With a little help from a friend (it’s always great to have a friend or family member to consult in these situations), I’ve clarified some aspects of the project that will help me over the wall and get back on track. 2. As a wool embroidery project, I can interpret things pretty much any way I want to, as long as the type of stitching works with my fabric and threads. 3. I can also incorporate other media into the project – it does not have to be strictly wool. Whether or not I do this is part of the planning. 4. I need to loosen up a bit with the project and have a bit of fun with it. Getting over-persnickity just makes things worse! I’ll be playing with the pomegranates this weekend, and next week, I’ll show you how far I manage to crawl on the project. In the meantime, what about you? Have you ever run into similar situations with projects, and if so, how do you deal with them? What’s your secret for forging ahead, or for guiltlessly laying aside a project to move on to something else? Will you share your thoughts with the rest of us? February 25, 2011 Wool Embroidery Project: Perspective is Everything! I have to say that when I get frustrated with a project, I don’t have any problem setting it aside. When I do put a project to the side I usually start on a new project, a simpler project, sometimes a kit. After I build up my confidence again and give myself some extra time to ponder the project I set aside, I will go back to it. The time it takes me to go back to it depends on the frustration level I had. If I don’t spend too much time worrying about the project then I have a renewed sense of “I can do it” and I will finish. Time always provides a new perspective. Mary, I’m glad you brought up this topic. I totally get the concept of planning out a project. It applies to so many endeavors in life. I have been particularly aware of the toil involved since the advent of blogs has given me a view into the world of people who create, in any artform. To me, that is what makes the difference between something that looks “home-made” or amateurish. I t really takes thought and vision to match the materials to the project and to each other. Those designers who do it well are the ones whose designs become popular. I have so much respect for those who keep trying and testing different things and making them available to the rest of us! Oh yes, the planning is no small part of preparation. I look forward to seeing what plans you come up with for this pomegranate project. I feel your frustration! Although I did the 6 P’s – every one in fact! – my current project isn’t looking the way it did in my minds eye when I planned it. Like you, I ask someone else for their opinion which usually helps me see things a bit differently. Then I try something different. I’m not afraid to take something out and try again. I’d rather do more work and end up with something I like than settle for something less. In fact, one bit of this current project has been reworked three times! I think that for most of us – even the kit designers – working out what you looks best in your mind and what looks best when it’s stitched are sometimes not the same thing. We only see the kits once all the kinks have been worked through. I suppose experience helps too, in knowing what WILL work. But all artists work by trail and error to some degree. The two most important things for me are trust yourself and keep creating! Mary, when I reach a hill that I cannot climb in stitching I walk away before I invest more time and frustration and turn myself off completely to needlework. Sometimes in trying to be a perfectionist we tend to want to finish first and anticipate all will go well. I would walk away from this project, eliminate it completely if you do not go near it with a month so it does not come back to haunt you and flip over the linen and use it for something else. Keep the wool threads as you will use them, and not to worry about investing any more time in a non-rewarding project at this time. Your talents are so admirable and you are to gifted to be held up by lack of creativity on a piece of needlework. I certainly can sympathize with this! I do mostly counted thread embroidery and have more than a few projects put aside because I am frustrated. This year I want to work though and finish all my works-in-progress. I agree that sitting down and making a decision about each piece is the only way to work through it. Usually just working through whatever is holding me up will get me rejuvenated enough to finish the project. Thanks for the post! You are frustrated, but you don’t say with what. You need to clarify what the problem is in order to ‘scale the wall’. You need that sounding board to figure out the problem and determine ways around it, or to decide that you can’t solve the problem and give up. But without knowing what the problem is, you can’t decide. Thanks for your comments! Good insights, and good to know we all get frustrated now and then with our projects. Sally – the frustration is due to my lack of planning. I had a vague idea of what I wanted to do, but didn’t plan anything in concrete. So the going is very slow on this project. Probably I would not notice the slow going as much, or be that concerned with it, except that I had begun blogging the project prematurely. I should have gotten a bit down the road and achieved something that I’d consider a bit more solid, with a clearer direction, before I jumped into writing about it. Linda – yes, stepping away from a project always helps! I have stepped away from this one for a couple weeks, but I’ve been mulling it over in my head, even when not working on it. So I’ve been able to clarify my perspective a bit. Kathy – I agree – what we picture in our minds and what we actually turn out is not always quite the same thing. I saw the white flower on your project (white, at your husband’s suggestion!) and I like it a lot! It really lightens up the design! Wendy – yes, blogging has definitely opened up my eyes to other people’s creative processes. I always think it’s fun to watch projects develop and change. We’ll see what comes of the poms over the next week! Hi Mary, Thanks for accepting me into this beautiful little place and that I never tire of walking, because you have some very valuable and useful. I congratulate you in heart, for your page you are teaching a lot of people like me like embroidery, but we are not able to attend custom classes. Hugs and God Bless you with all your loved ones. but thanks for sharing your frustrations with us. Hi, All – Thanks for your comments and suggestions! I appreciate them. I’m afraid I may have come across as “toooooo” frustrated – that’s not really the case! Just slow in working the thing out, because of some points of frustration, especially trying to “feel my way” through the project. Never fear! I made some progress this past weekend. My plan has reverted to K-I-S-S – Keep it Simple, Stu… no, Sweetie. Patty – Just to let you know, the “ripped out” section in the photos above were from the very beginning of the project. I haven’t ripped out any leaves since then! 🙂 Some folks don’t mind ripping stitches out, and I suppose I’m one of those. I’d rather remove the things I don’t like and re-do them, than work on a project with something nagging me the whole time. But it depends on one’s approach. Some people may very well have a strong aversion to taking out stitches, and might do everything possible to avoid that scenario. But I do agree that, for beginners, kits are the way to go, so that you can get a real feel for technique, without the worry of design, stitch choice, color choice…. I have tried several projects with counted cross stitch and each time I end up putting it aside. What I had to conclude is that despite loving the picture to be stitched and the fact that I can do this, I really hate cross stitch. Now I have a few in the drawer that I need to find homes for and have vowed to never buy another cross stitch project. I have many other needlework interests to get hung up on something I really don’t enjoy. My solution for UFO’s-There are no UFO police.-Contrary to what your mother taught you what you start doesn’t have to be finished. If I can’t recycle the materials I give it to a friend or put in my church’s white elephant sale. My self-image is of an organized person who always knows what she is doing. Wrong! I like to design my own projects and I’m always running into problems but I figure that’s why I wake up at 3AM. Instead of worrying about things I can’t do anything about, I problem solve and if that gets too difficult maybe it will put me back to sleep. Hi Mary, I see (raised) pomegranate seeds bursting from the fruit. The rigid leaf frame enclosing the fruit is too structured. Keep some but in between remove leaves so the fruit is the central focus. When stitching I feel so confident in what I am doing I put that project aside as I “know” can easily pick it up again. Then a few weeks/months later come back to it-the flow isn’t there so frustration. Learn to complete projectn- opposite of putting aside when problems arise. Though I do have a few of those yet lucky to have resources of teachers and also the wonderful Country Bumpkin handy. Pomegranate seeds bursting from the fruit. Part of the formal leaf background/frame removed. It looks enclosed is the impression so closes the mind to creativity. I do have the same problem but my main is the opposite one. I feel so confident in working a project that I think “well I’ll be able to pick this up again in a few weeks”. Then the flow isn’t there the stitches come out differently so learnt to go with the flow and FINISH. I’ve written the P’s in my diary as it really applies to life. Looking forward to see the next in Pomegranate Passion. I actually ordered the threads for this project intending to stitch along with you. They haven’t arrived yet – the Hedgehog is a bit slow right now! I plan to do it on linen twill and I may not do more than one corner. That is lots of leaves. Perhaps the linen you are using is lighter than twill and making the stitching a chore. Try a small area on some twill and things may go smoother. 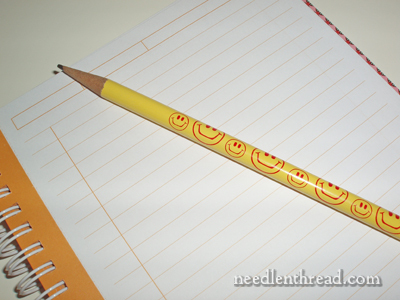 You have such a happy pencil! Haha, just needed to mention that! About the frustration..generally, I put it away for a little bit and then come back to look at it, or I show it to someone else, or if I really, really don’t like it, I ditch it all together. Hobbies should be fun, so I’m not going to force myself to finish something I really don’t like. Asking others also really helps, or sometimes if it’s a particular thing that bugs me in the design or planning itself, I go back to the drawing table and try out something completely different, or I stitch up little test pieces to try my idea out before getting back to the frustrating ‘final’ piece. That way, I can have fun stitching and I also create more enthusiasm for getting along with the final piece, kind of a ‘now I know!’ kind of enthusiasm. The test pieces, if I like how they come out, I sew them together as a kind of patchwork thing and they’re a seperate piece. Fun to look at and remind yourself it’s good to try things out before plunging in! Good luck with your project, I always love to read your blog and your stitching is beautiful! Hi Mary. I find it best to put the project aside for a bit and allow my sub-conscious to work out the problem, the answer usually pops into my head when I’m doing something totally unrelated – and then I kick myself… The other thing I’ve had to learn is to be willing to unpick, unpick and unpick again until I get it right. As Kathy commented, people only see your kits (patterns) once the kinks have been worked through. Your pomegranates are looking really good though, so I’d put it aside for a bit and see how you feel in a week or two. And then just listen to you gut go with whatever it’s telling you. That’s what I do. Good luck, Kelly. PS Thanks for the comment re cloud/wave stitch, it’s a very good point even if it does make things even more confusing! Hi Mary! I sympathise and will remember your great 6P acronym! I’ve also learned this the hard way and, as anyone who clicks on my name and looks at my blog will see, I’m fighting with my needlework at the mo as well and not doing a whole lot with it. Prefer reading, art and viola at the mo!! Everyone else has already given the inspirational, upbeat, words of wisdom. What I have are questions. Thought of doing some pruning? A while ago I believe you posted a pattern containing pomegranate,leaves and bird. Take some leaves out on one side, put bird in? Another side, take some leaves out, put pomegranate flower in? or butterfly or caterpillar or anything really except more leaves since I figure that the problem I would be having with this project is with doing too muuch of the same thing. I normally run two projects at a time. When i run into a brick wall i normally call Colleen Goy, and she quickly helps me on the right track or just peaking to her sparks off an idea. Perhaps speak to someone that you are colse to ie Trish Burr or google some pomogranate images on the net it may just kick start something. I tend to be the forge ahead and get it done type of personality. When I get stuck, I just follow the directions step by step even if they do not make sense, or I go to another section and finish the rest and return to the part I did not understand later. By the time I get back to that place, it usually makes much more sense, since the areas around it are filled in. I agree it is also helpful to have a friend or crafty family member look at it. Usually they remind me that I have a tendency to turn from left to right when I started right to left or create top to bottom out of something that should have been bottom to top. When I do this, places that should match/meet smoothly, do not and then the work doesn’t look pretty, but looks like a storm hit the tree, or flower and broke the stem from the petals or cracked the branch. I usually stitch over it and use the original work as padding, but it is frustrating. I have learned a lot about how to fix this through the discussion about s vs. Z twisted thread. 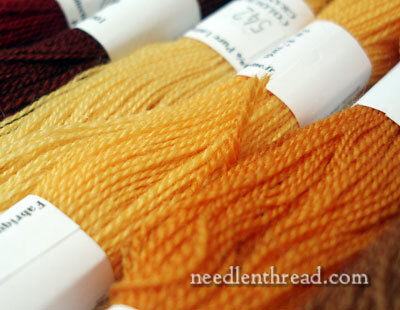 Since my thread stash comes from all over the world, sometimes switching to different brands of threads works wonders. Hi! Well, I sure know what you mean! I’m only a fledgling of the art of embroidery, but I relate to this when it comes to my sewing and knitting. I have learned to not give up on anything, but rather to, consciously, set it aside and come back to it — maybe even months later — and it always looks much different (and entirely not so bad as it felt!) and never as monstrous as I over-dramatized it :D. I think it takes fresh eyes to re-evaluate. Most times I’ll pick up where I left off, see it clearly and can fix it, maybe undo part of it, or simply re-start the entire thing with no stress. It’s never quite as bad as it feels when in the throes of it! The few times I’ve had to make a decision whether to continue with a project, it is whether to “let go” rather than “give up”: There is a difference! I glean what I learned from it, how my work is improved/benefits for having done it, and then salvage what I can from any expenses — most times it is not a waste!